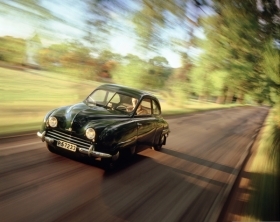 The Saab 92 from 1950. Saab will decide within the next few months whether to build an entry-premium car to compete with similarly sized premium models from Audi and BMW, said the chief of Dutch carmaker Spyker Cars NV, which bought the Swedish company this year. Victor Muller, the CEO of Spyker, said he is deep in talks with potential partners about procuring a platform to make a new version of the tear-drop-shaped Saab 92 model from 60 years ago. The decision whether to go forward with the new model, which would be introduced in 2013 at the earliest and be the first car fully designed under Spyker's stewardship, would depend on economic conditions, partners and financing, Muller said. "That is my job for the next 100 days," Muller said on Wednesday at a launch event for Saab's new 9-5 flagship, the first since Spyker took over Saab in January in an $400 million deal with General Motors Co.
A retro version of the new 92, if built, would be aimed at a fast-growing car segment for premium small cars, which includes BMW's Mini and the new Audi A1, which launches in Europe this summer. "The 92 has to be the most stunning looking, the most ingenious and the most premium car. It has to undeniably be a Saab," Muller said. Saab would choose a chassis platform from a bigger carmaker rather than make the investment for a car that would have a projected yearly production run of 30,000 to 60,000. Asked whether Saab was in talks with Volkswagen or Hyundai Motor Co., likely platform partners, Muller said there were no talks with the Korean automaker and declined to comment further. Muller said a new Saab 92 would be priced "about 10 percent more than a Mini," which starts at 16,600 euros in Germany. Saab needs about $300 million to develop each new model and would have to secure financing as its current funds are already earmarked for planned models and upgrades. Muller did not link plans for a listing in Stockholm to the 92, but said that once the group announces half-year results on Aug. 28, he and Saab CEO Jan Ake Jonsson would set off for a investor roadshow to drum up institutional interest in Spyker. "We're not planning to offer shares any time soon," he said. He had indicated earlier this year that Spyker would also seek a London listing and possibly delist from Amsterdam's stock exchange but said that an Amsterdam-Stockholm dual listing was the most likely scenario for now. Muller also said that Spyker will almost double the number of dealers selling its high-end sports cars this year by offering them through Saab outlets. “We are signing up Spyker dealerships left, right and center,” Muller said. Spyker intends to boost its dealer network to 60 from 35 in 2010, and to about 90 by the end next year, as Saab dealers open their doors to models such as the C8 Aileron, which can reach 300kph (186 mph) and sells for $214,990 in the United States, he said. The new dealerships will help Spyker, which sold 36 cars last year and has been a money-loser since it went public in 2004, to become profitable, Muller said. The Dutch supercar maker has also started benefiting from lower prices for “generic” parts such as windshield wiper motors that Saab gets through its higher volumes, Muller said, adding that Spyker plans to tap Saab’s engineering resources.